Yesterday was a good day. Bryce played his fourth football game of the year. And the Marshall Redhawks JV team won another one! Way to Go Reedhawks! They have a 4.0 start this season. The experience at Motts was exactly the same as in the cancer center. Nurse: “Can you tell me your name and birthdate?” Me: “Yes, and I can tell you my MRN and CSN numbers as well if you like [smile].” After four years I know the rituals all too well. They use your name, birthdate, and UMHS assigned IDs to verify that the treatment they are about to give me is the treatment intended for me. It is comforting to know that the probability of getting the wrong medication is systematically mitigated to nearly zero. I just hope that the doctors will know the “right” medication to give you, that will FOR SURE knock out cancer. Unfortunately we may have to wait a while for this. One noteworthy difference about the infusion center in the Motts facility was that it was very quiet and calm. Which I did appreciate. My Erbitux treatment #15 went as expected. The plan remains the same. Erbitux treatments for one year. So there are another ten treatments to go. More than half way done with the plan! So far, SO GOOD!!! And I’m managing quite well through the treatments. I have been feeling more fatigued after treatments (possibly a cumulative effect) but I’ll take fatigue over outright sick any day. 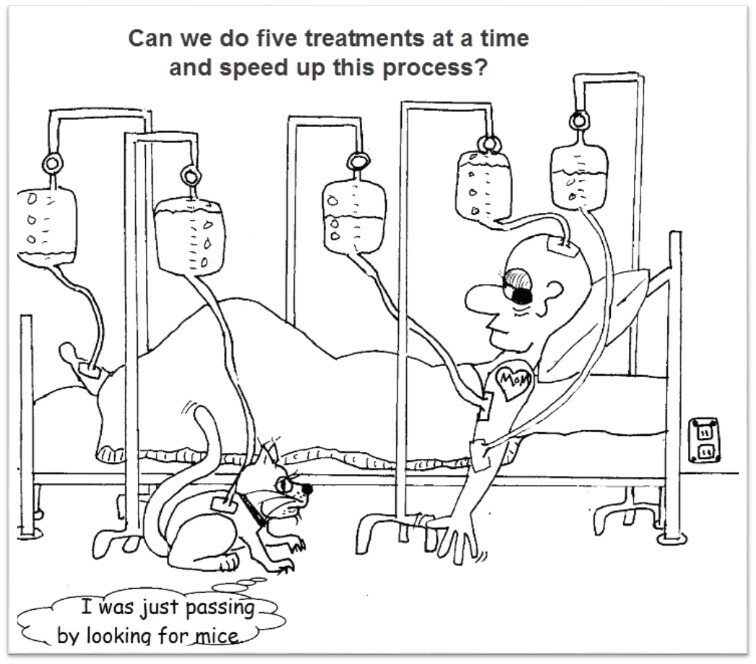 And, if the chemo results in a long-term-remission than all the nasty side-effects were but a small price to pay! The best news is that my last scans (done in June) were “all clear” and the CEA blood marker continues to come in at “under 1.0.” As you experienced readers know, the CEA is a protein in our blood. Normal is under 3.0. If this marker goes above 3.0 it is an indicator of colon cancer activity. So we relish the under 1.0 reports every time they come in. I was still waiting for the CEA results from yesterday’s test. I usually receive the results the same day, via a text message from Pam (Dr. Krauss’ nurse practitioner). She forgot to text them yesterday but responded to my inquiry text message that she would let me know today. I fully expected the “under 1.0” text from her this morning. When the caller ID showed that I was receiving a phone call from UMHS my heart quickly sank into my stomach. I don’t usually receive a call unless there’s bad news. I put my meeting on hold and accepted the call. It was Kim from Dr. Krauss’ office. Dr. Krauss asked her to call and let me know that the CEA was normal (e.g. under 1.0). My next scans are scheduled for Monday September 28. And I am hopeful that the scans will continue to show “all clear” as well. Thank you all for your continued support and prayers. I am truly blessed to have so many wonderful and caring people praying on my behalf. Thank You Jesus! For this awesome rainy morning. And for the wonderful souls you have brought into my day, my week, and my life. My time with all of them on this great earth is so amazing. I can’t thank you enough for the countless blessings. Thank you Jesus! I hope your Friday is the best and this weekend is better than the best!